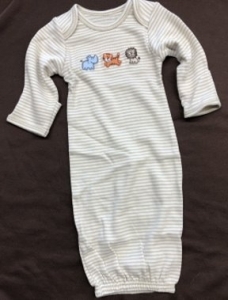 Adorable Boy's Gown for your Reborn Babies. Blue Striped Gown for your Reborn Babies. Sweet Gown for your Reborn Babies. 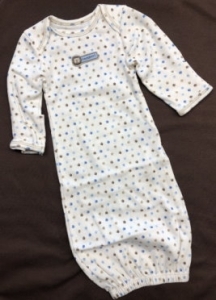 Infant Hospital Gown - Snap Front Opening. Purchase in quantity and save. 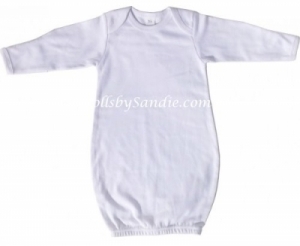 Hospital Preemie Rib Knit Gown with Snap Front Opening. 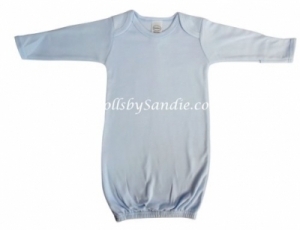 100% Cotton - Tag says Preemie - up to 7 pounds. Rib Knit Gown - Snap Side Opening. This angelic 65% polyester/ 35% cotton two piece set pink batiste button front bag with hand fagoted collar - smocked inset. Includes bonnet. This adorable 65% polyester 35% cotton white batiste gown bag with pink smocking and matching hat.